Antonio Rudiger has revealed he didn't question Antonio Conte tactics and he was probably dropped for the game against Southampton because of his comment after the last game against West Ham. Gary Cahill replaced Rudiger in the Chelsea line up on Saturday and Antonio Conte revealed Rudiger omission was a tactical one. "Probably. But I didn't mean it that way." "It was a fact, it wasn't about the tactics. 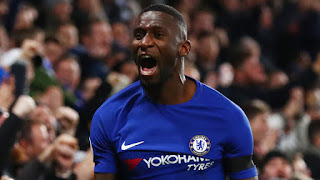 I did not attack anyone personally, I meant us as a team"
Rudiger was also asked about his relationship with Conte and Chelsea hope of winning the FA Cup. "It's just normal from my side. He's my coach. I must respect him. And he's a very, very good coach." "Not winning it would not be worthy of Chelsea, It's a very, very big club in England and the fans always expect you to win something." "I think it would be a good reconciliation [with the supporters] with the FA Cup." Antonio Rudiger will hope to return to Chelsea line up on Thursday when they face Burnley away. Do you think Rudiger was missed in the game against Southampton?